Steven Rado, One of my favorite physicists, in my opinion resurected the Aether in 1994, with his Aether Gravitational Sink Vortex Model. “As an introduction to the investigation for the causality, origin and maintenance of the gravitational sink-vortex, consider first the possibility, as we have learned about vortices in hydrodynamics, that a similar pattern, once it’s formed in the Aether, has no reason to dissipate into randomness again, unless its dynamic structure is destroyed by another dynamic structure. With this in mind, consider the illustrations of Figure-1, showing a kinematically natural chain of events, triggered by the least possible local disturbance in the isotropy of the medium which eventually could evolve into a locally organized, permanent and autonomous circulatory system of a three-dimensional donut-vortex. (a) As the illustration shows, any relative motion between two layers of an isotropic medium can generate local turbulence. The different speeds of the layers shown at the left are equivalent with the opposing relative velocities shown at the right side. (b) Under suitable circumstances this relative motion can act as a torque and induce rotational motion. This form of disturbance is called vorticity and it is quite common in moving fluids, especially within the fluid of a large scale vortex, where, due to its differential rotation, each layer of the medium represents a different angular velocity. (c) While the torque of the relative motion of the layers acts continuously, a centrifugal tendency of rotation comes into existence. This is simply the nature of motion, that each particle tends to move on a straight path and therefore tends to get out of a circular one. 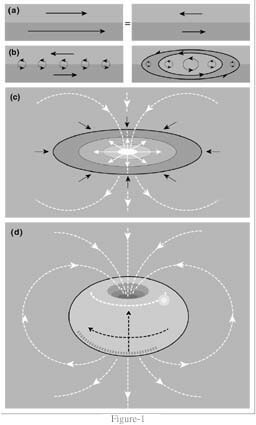 This centrifugal tendency opens up the center of the beginning vortex and creates a local rarefaction in the middle, which then gradually develops into a sink. It follows, that both from the top and bottom of the plane of the vortex, the fluid starts drifting toward the rarefied area of the sink. Let us now assume, that by chance, the flow from the top has a slight advantage and the two drifts of opposite directions collide somewhat below the plane of the vortex. “Applying all these to the ideal fluid of the Aether, it follows that the dynamic flow pattern of the Donut-vortex which evolved under the constant isotropic pressure of the Aether, is a highly condensed permanent state of the medium in permanent equilibrium between all components of dynamic and static pressures. This is then the AETHRO-DYNAMIC description of a natural tendency of the all-pervading Aether: The condensation of its kinetic energy into the dynamic forms of elementary particles, binding forces, electromagnetic fields, atoms, molecules, crystalline structures, etc. A natural, evolutionary condensation of kinetic energy into ponderable matter. This work above quoted from Steven Rado – (http://aethro-dynamics.com/) is an ideal gas model of the aether that is unlike the aether/ether of Michelson & Morley. Its good as your other content : D, thanks for posting . “A gift in season is a double favor to the needy.” by Publilius Syrus. And then lastly a good write-up regarding the subject matter, continue the truly great work and therefore Hopefully to understand considerably more in just a person eventually. This is really fascinating, You are a very professional blogger. I have joined your feed and stay up for in search of extra of your excellent post. Also, I’ve shared your website in my social networks!